Jamie Oliver likes to talk a lot about "being brave" when you're cooking. This usually involves chopping up some red chilies. I've never really considered this bravery but perhaps I am just without fear. Tonight we had to be brave as well and, against the weather forecast's prediction of rain, have an outdoor barbecue. It really wasn't a big deal to me since it has rained every single time I've grilled this summer. I was just afraid that our guests wouldn't be as willing to sit out in the rain to eat their food. Okay, I guess that's not that brave either. Maybe I should go get some red chilies. 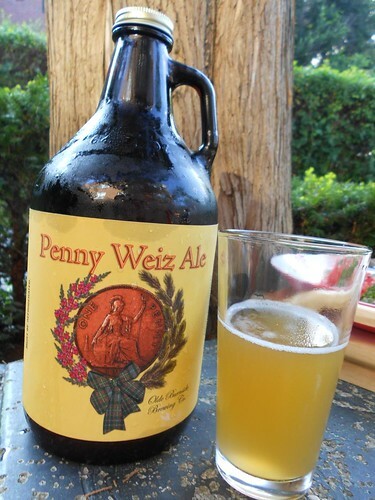 As I grilled, I enjoyed a beer from this growler of Penny Weiz from Olde Burnside Brewing Company. Jen also made some ginger syrup this morning to make dark and stormies to accompany the weather prediction but we ended up not using it. Apparently we're going to have to make a large amount of ginger beer in the coming weeks to use it up. 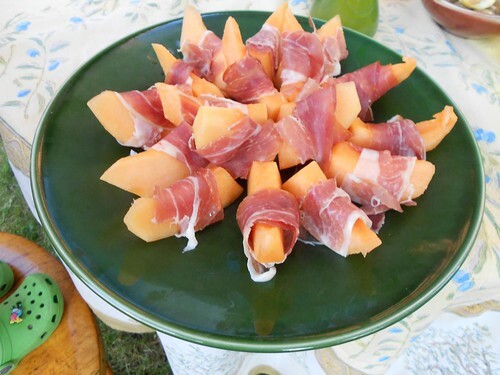 We started off with cantaloupe and prosciutto, lemon olives, nuts, and the pickles Jen had made on Monday. 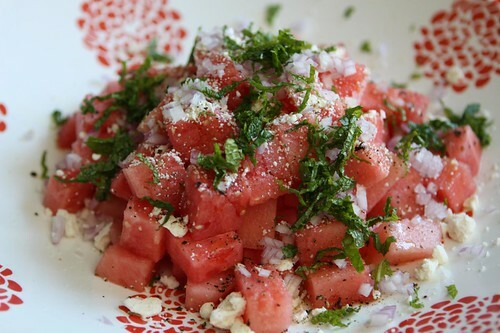 It was a melon heavy evening as I also made this watermelon salad with feta, mint, rice wine vinegar, olive oil, and black pepper. The pickles were fantastic. 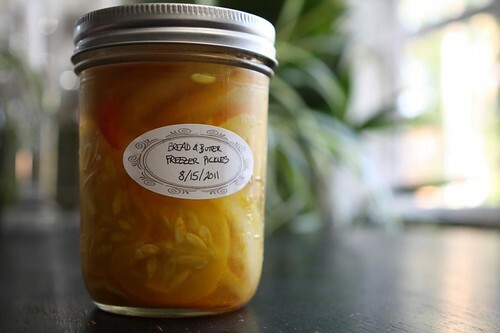 We went through an entire jar in about twenty minutes. I also slow cooked some St. Louis pork ribs for four hours in the oven at 250 degrees. This is the second time I've done slow cooked ribs this month but today I had a little time so I doubled the oven cooking. This made for some really tender ribs but I've got to recommend not slow cooking in an oven in August. It's an unhappy maker. Also on the menu: grilled corn with cotija, lime, and cilantro and grilled chicken wings. In other news: I discovered some sweet potatoes are liars. There are sweet potatoes that look just like regular sweet potatoes but when you peel them you discover their flesh is white and not a beautiful orange color. Now, I happen to like white sweet potatoes. I find them to be sweet and delicious, however, for this sweet potato salad I had hoped to get a beautiful color contrast between the orange of the potato, green of the vegetables, and purple of the onions. Instead I got white sweet potatoes which kind of turn into a grayish-green mess. Albeit a delicious grayish-green mess. Jen is also a liar because she told me she would take a picture of this sweet potato mess but she did not. It's probably better that way. 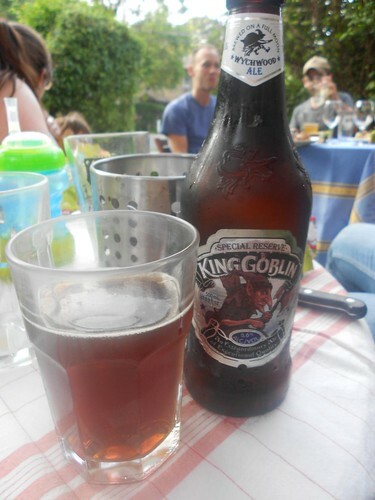 A dinner guest also brought this King Goblin from Wychwood Brewery. That's two beers. Two beers in one night! We finished off the evening with some berries, whipped cream, and angel food cake. The crowning achievement of this meal was that we ate it all outside! This is a rarity to apartment dwellers such as ourselves. It's rare that we get to treat ourselves with mosquito bites, lugging tables and chairs in and out of doors, and generally being very negligent in our photo-taking. What kind of dinner doesn't get photographed anyway? Think you can slow cook the ribs at 200 degrees,which is plenty hot enuff. Particular for St. Louis style. Some of the best ribs I have ever had I ate in Norristown PA. The restaurant wrapped the ribs in Saran, then foil and then in a confection oven at as low as they could set it. Seemed funky but the saran does an outstanding job of keeping the meat moister than just the foil overwrap. And I am old enough that if this heat on platic wrap is carcenigenic there will be a host of other things that get me first. I'm not too worried about the plastic wrap. Every time I cook ribs I cook them lower and slower but eventually I reach a point where I'm worried I'll have to start them a week before consumption. I don't think I have the patience for true barbecue.